Build almost anything you can imagine with structural aluminum framing extrusion systems. The high degree of versatility provided by the basic T-slot design allows you to meet the specific needs of your production area as you easily design and assemble customized tables, lifts, stairs, and much more. 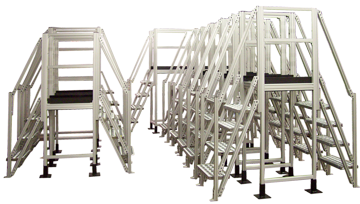 Our customers have solved material handling, guarding, and machine framing problems using these easily assembled products within their production flow. Still others have improved the general efficiency of their facilities in areas outside the production floor. HTE Automation supplies Kansas, Missouri, and Illinois with highly adaptable structural framing extrusions.